IF you are facing a divorce and have found your way to this web page, you deserve congratulations because you have taken the important step of deciding to inform yourself about your alternatives. One of the principle objectives of our first session together is to spend time discussing your available options, the pros and cons of each, and which alternative best suits your particular situation. In many cases, mediation is the most appropriate and constructive path through separation or divorce and into the next stage of your life. 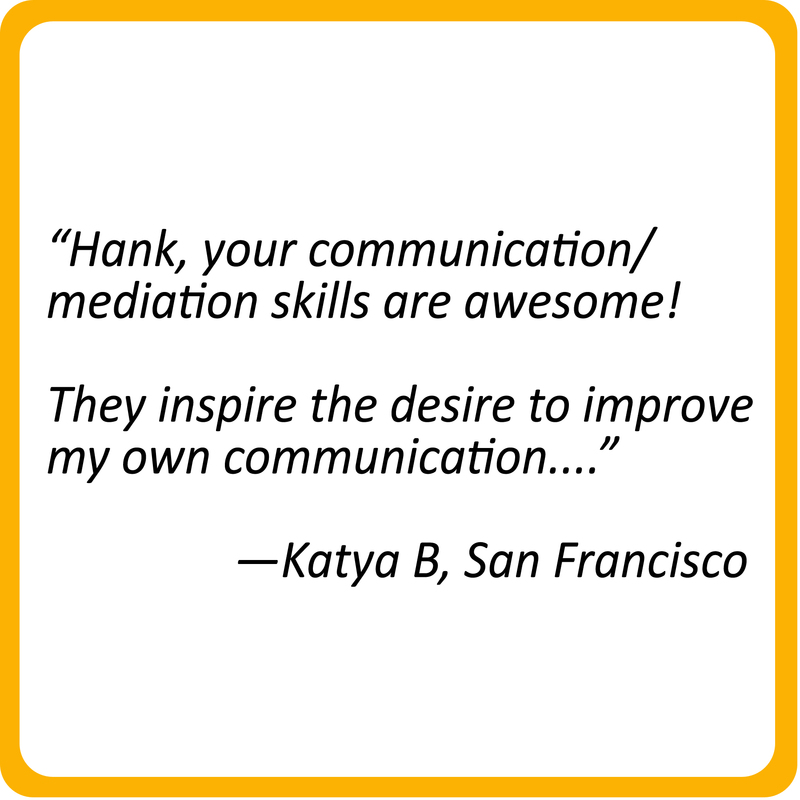 But what is mediation? Mediation is a three-way communication process for talking about and negotiating difficult issues. 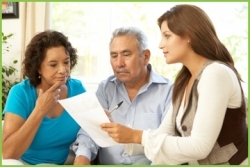 The participants in a mediation are the two people who are affected by the difficult issue (here a divorce or separation) and a neutral third party known as a mediator who helps the couple to decide for themselves the terms of the agreement they need in order to proceed with their lives. Several qualities distinguish mediation from litigation, arbitration or attorney represented negotiations. Constructive Communication Facilitation: First, in mediation the parties receive valuable support from the mediator who creates a safe and attentive space and process for saying to the other and hearing from the other the difficult things that unspoken can prevent agreement or severely weaken the durability and lasting benefit of whatever agreement might be reached. Party Control over Both the Process and the Outcome: Second, in mediation the parties are in complete control over whether an agreement is reached and what the terms of that agreement are if it is reached. Participation is entirely voluntary. Within wide boundaries of reasonable conduct, the parties retain complete control over both the direction of the process and the outcome. Collaborative Process Discourages Bad Behavior: Third, as a collaborative process over which the parties retain control, mediation reduces or eliminates bad behaviors, such as concealing information, overstating and distorting one’s positions, and generally making life difficult for the other party. Such behavior is common in an adversarial process and degrades the quality of the outcome of such process. Empowered by Personal Sense of Fairness: Fourth, although mediation involves discussion of the relevant legal standards, it empowers the parties to make their personal sense of fairness the most important factor in deciding the terms of their agreement. Such agreements are often more willingly performed by both sides. Agreements based primarily on the parties’ sense of personal fairness can also greatly assist the parties’ efforts to put the divorce behind them and move on with their lives. Establishes New Patterns for the Future: Fifth, as a guide in navigating difficult conversations, the mediator helps the parties to let go of unconstructive communication patterns and to begin practicing new, empowering patterns that can help each party find more success in their future relationships. 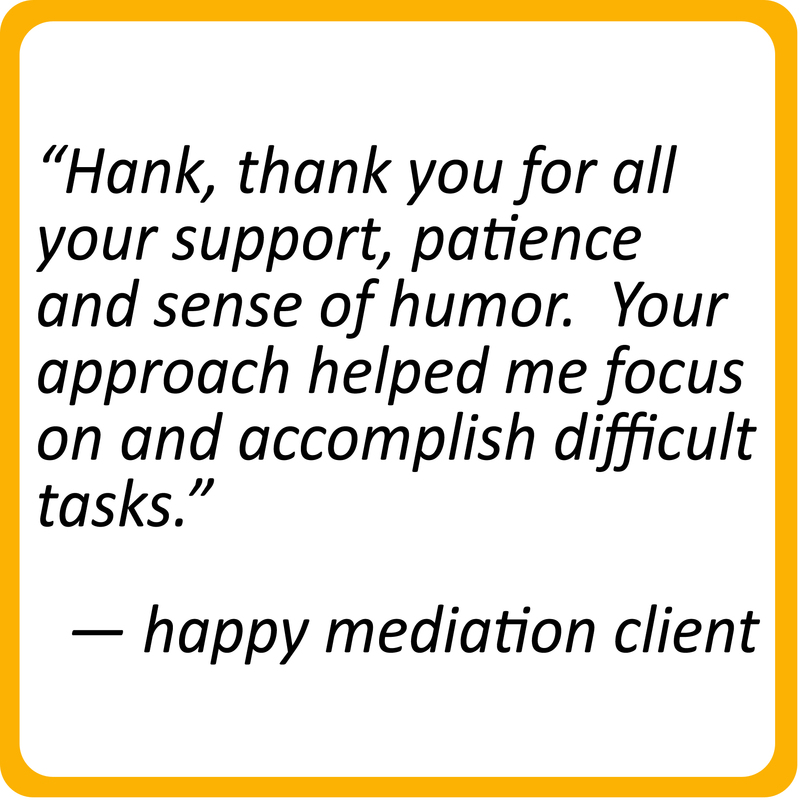 Economical, Efficient and More Satisfying: Sixth, mediation is generally more economical, efficient and satisfying than an adversarial process. A litigated divorce, on average costs $20,000 per spouse and, in acrimonious cases, can cost much, much more. Litigated divorce also can take months and even years to complete and often requires the parties to adopt postures that hurt each other unwisely. By contrast a full mediation often takes between 5 to 10 two-hour sessions and costs between $4,000 and $10,000 to negotiate the agreement, file the necessary papers, and obtain a judgment. Of course, the amount of time required and the associated cost does depend upon the parties who remain in control of the process throughout. However, because mediation is a constructive communication process, time invested in it generally results in better understanding, a wiser, more durable agreement, and greater closure for both individuals. WHEN going through the pain and emotions that accompany separation and divorce, it can be daunting to consider working with your spouse to find solutions to your conflicts that will meet both of your needs. 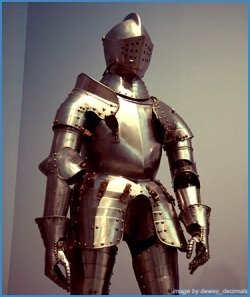 The rewards for drawing upon your courage and undertaking the hard work of talking things out with the help of a mediator, however, can be substantial. 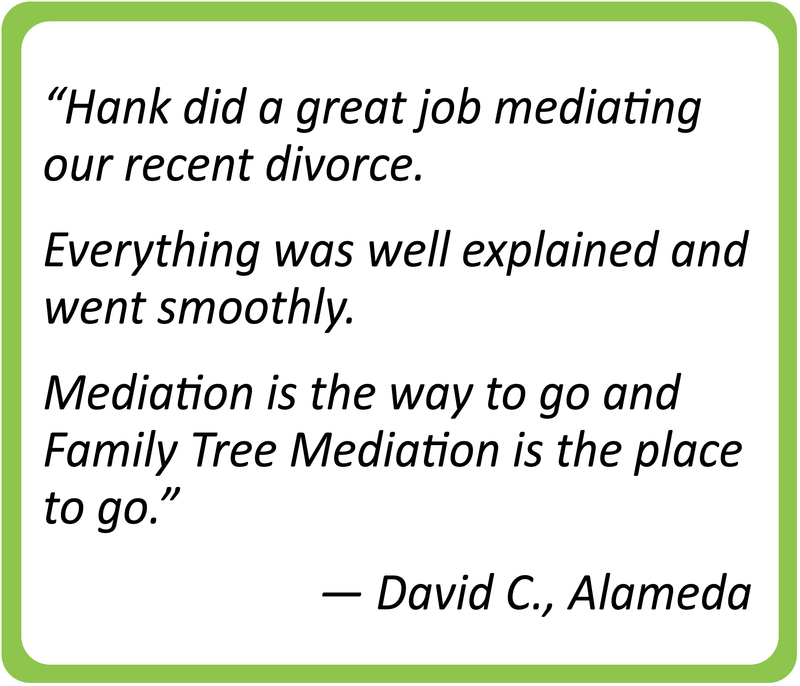 At Family Tree Mediation, I try to make it easy for you to consider the mediation process by making the first session free if you choose not to proceed with mediation. 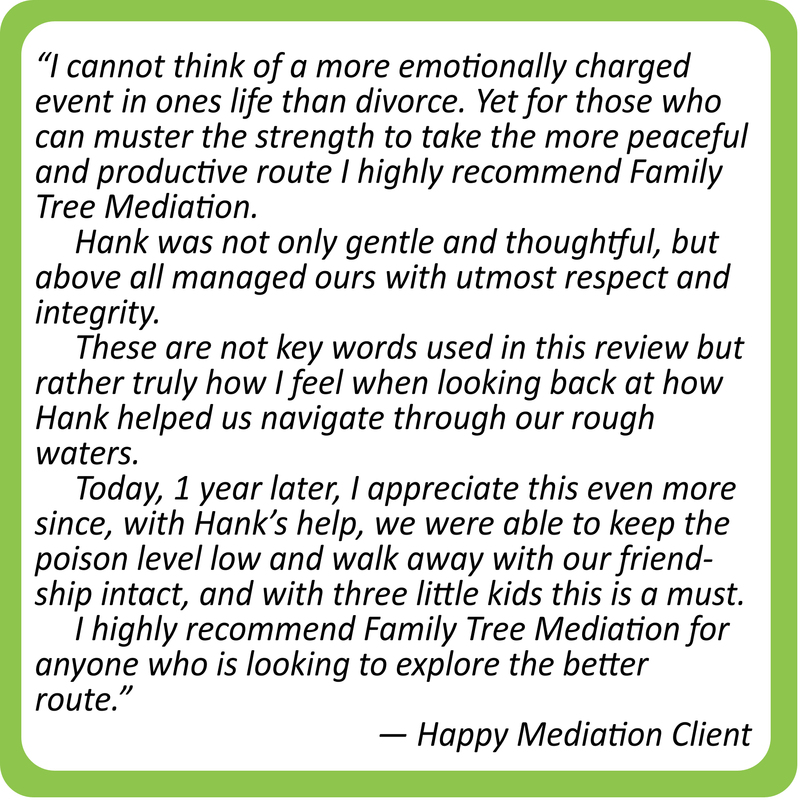 Even if you decide not to mediate with Family Tree Mediation, you will have gained at no expense more clarity about your options and what approach might work best for you. So the question I ask you to pose to yourself and your spouse is whether the benefits of mediation are worth exploring enough to make an initial risk-free appointment. If the answer is yes, you can schedule your appointment by calling me at (650) 762-TREE [762-8733] or email me using the email form on our Contact Us page. Also, please call or email if you have any questions you would like to discuss. In each mediation, the time required, the twists and turns encountered, and whether or not an agreement is finally reached depends upon the needs, willingness, and abilities of the divorcing or separating spouses. 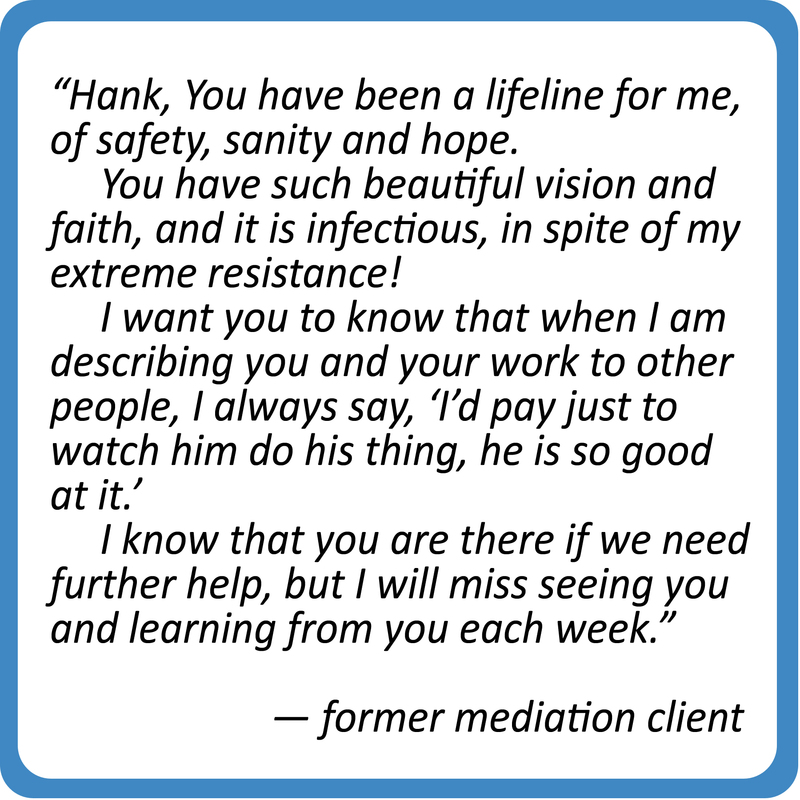 For this and other reasons, every mediation is unique. And yet, it is possible to generally sketch what a mediation often looks like. Described below are seven activities that largely make up the mediation process. These seven activities do have a general sequence and may be thought of as steps, but in actual practice, one finds that mediation often requires going back and forth between the various steps at different times throughout the process. 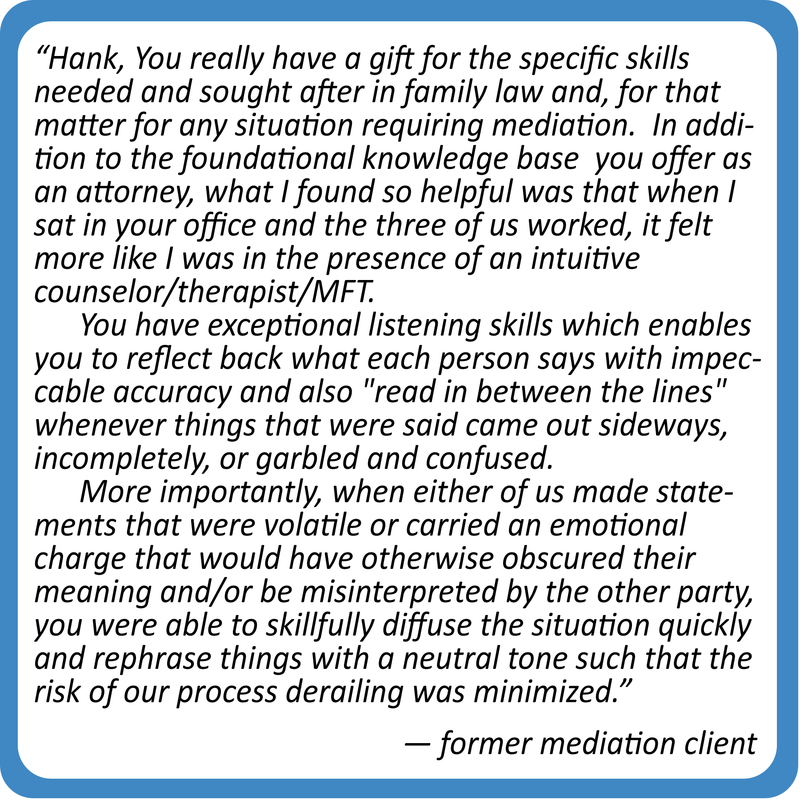 With this caveat, the summary below provides some specificity about the mediation process that I hope will be helpful to prospective clients. Discuss entertaining a conflicting view without surrendering one's own.